2018 Rural College Access and Success Summit Set for May 13-15 . . . Rural Trust Partnering With AASA . . . Why Rural Matters 2015-16 Now Available! . . . Find Resources to Achieve Racial Equity in Your Community . . . . . . Subscribe to the Rural Trust Newsletter . . . This article appeared in the September 2014 Rural Policy Matters. Editor's note: Links are free and current at time of posting, but may require registration or expire over time. Rural schools have unique resources for learning that are related to their own communities, cultures, and natural environments. Incorporating these resources into academic approaches can have big benefits both for students and for the community. This fall Rural Trust Global Teacher Fellows participated in place-based learning workshops. These rural teachers received fellowships for international travel and spent much of the summer traveling to places as diverse as Asia, Scandinavia, Africa, and Central America. As part of the workshops they considered how they will translate their international travel experiences into their classrooms in ways that focus students on their own community and its connections to other parts of the world. Rural Trust Global Teacher Fellows gather for place-based learning workshop. In rural north Florida, teachers in Greenville and Quincy also participated in Place-Based Learning Institutes. As part of the Institutes, teachers made maps of the community, brought in artifacts of place, explored community history (singer Ray Charles was born and spent his early years in Greenville) and considered ways to connect student learning and resources of place across the K–5 curriculum. 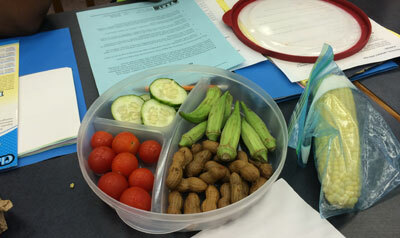 Some of the local artifacts of place collected by teachers at Greenville Elementary in Florida. Place-based learning is not a separate curriculum or program. Rather it is a framework for approaching teaching and learning that can be integrated across curriculum and grade levels. It engages students, teachers, and community members to explore and discover resources and opportunities right in their own communities in the form of culture, history, the natural environment, the local economy, and issues and opportunities that residents want to address. Students, even very young students, learn about their community. Academic work is tied to place is ways that matter both to students and to others in the community. The ability of place-based learning to engage student interest in academic work translates to improved academic performance. Students learn to put their knowledge to use in a variety of ways that make a difference. They see the relevance of academic work and they experience the affirmation of doing something of value to people they care about. For schools that must focus on raising student standardized test scores, place-based learning offers a way to support outcomes while promoting genuine learning in rigorous and engaging ways. If your school or community would like to know more about place-based learning or would like to schedule a Transforming School and Community Through Place-Based Learning Institute, contact the Rural School and Community Trust at info@ruraledu.org. Read more from the September 2014 Rural Policy Matters.